Morgan has released details of its most extreme roadgoing model to date, the race-inspired Aero GT, capable of 170mph and a 0-60mph time of 4.5 seconds. Just eight of the new Aero GT will be built, and each one has already been pre-sold to existing Morgan customers. Each will be built to the individual customer's specifications. Using lessons learned from Morgan’s GT3 race victories, the Aero GT is based upon the lightweight aluminium Aero 8 but with an all-new hand-worked, aerodynamically honed body which reduces drag but significantly increases downforce. Every panel has been revised with new wing top louvres, deep side impressions and a radical rear diffuser. It's powered by the same 367bhp 4.8-litre BMW V8 and six-speed manual gearbox found in the Aero 8. This naturally-aspirated BMW engine, however, is no longer in production, which signals the end of the Aero 8 line as we know it. The Aero GT will therefore be a last hurrah for the Aero 8, and Aero GTs will be the final eight cars of the Aero 8 line to roll out of Morgan's famous Pickersleigh Road factory in Malvern, UK. The Aero 8 was actually conceived during the development of the 2015 Morgan Aero 8, but never saw the light of day. The Aero 8 itself was first unveiled at the Geneva Motor Show in 2000 – a bold new design, with lightweight aluminium construction, that ushered in a new level of performance for the Morgan brand. 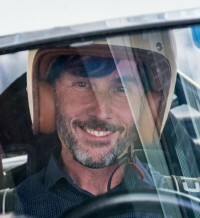 Jon Wells, Head of Design at Morgan Motor company said of the Aero GT: 'The beauty of working so closely with talented sheet metal workers and coachbuilders is that designers are relatively unrestrained in their ability to challenge the forms and their functions. 'Unlike many, we are able to make truly special limited edition vehicles that really exercise the imagination of the designer and the ability of the craftsman. Steve Morris, managing director of Morgan Motor Company, said: 'One of our greatest strengths as a brand is our ability to be responsive and create a hand-built car which is truly bespoke to each customer. I am a proud owner of an Aero 8 myself; it has been a stalwart of the brand and offers an exceptional driving experience, that only gets better in Aero GT guise.